Il progetto "Focus 06 una comunità per il benessere dell'infanzia", della durata di due anni, è stato selezionato a livello nazionale dall’Impresa Sociale “Con i Bambini” attraverso il “Bando Prima Infanzia 0/6”. Erasmus+ è il programma dell'Unione Europea per l'istruzione, la formazione, la gioventù e lo sport (2014-2020) che sostiene attraverso finanziamenti comunitari opportunità di studio, formazione, confronto, esperienze lavorative o di volontariato all’estero. 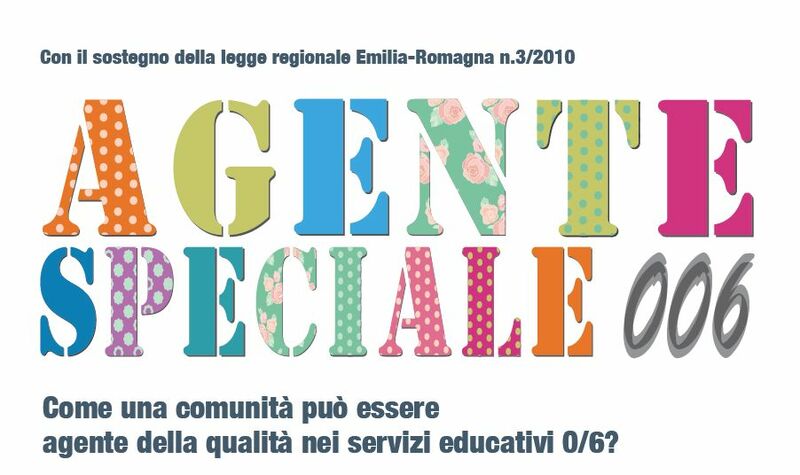 Il progetto "AGENTE SPECIALE 006 - Come una comunità può essere agente della qualità", promosso dal Settore Servizi Educativi e Scolastici dell'Unione Terre d'Argine, è stato candidato al Bando legato alla Legge Regionale n.3/2010 in favore dello sviluppo di processi partecipativi, aggiudicandosi il secondo posto tra i 64 progetti ammessi alla valutazione (Determina di Giunta Regionale 14153/2015). Nell'anno scolastico 2015-2016 il Coordinamento Pedagogico dei servizi 0/6 (comunali e convenzionati) dell'Unione Terre d'Argine ha promosso il progetto "Così è...se ci pare 2.0" che si pone in continuità con il percorso precedente ed è volto ad approfondire le tematiche contenute nel Vademecum del rappresentante dei genitori. The project ''Focus 06 a community for the children well-being'', which lasts two years, has been selected at national level by the Social Enterprise Con i Bambini through the ''0/6 Early Childhood announcement''. The project, where ACEG - Istituto Sacro Cuore of Carpi plays the role of leader together with other 22 partners (public, private and third sector), is aimed to promote interventions addressed to parents and children from 0 to 6 years old in order to increase well-being and to battle child educational poverty. - Making adults more aware of the well-being of children as a factor of the social well-being of the local community. Erasmus+ is the EU’s Programme to support education, training, youth and sport (2014-2020) which allows, through EU funding, opportunities for study, training, comparison, working or voluntary experiences abroad. Every year scholastic organizations can participate in an announcement in order to present specific projects of mutual exchange with other EU schools, constituting a partnership to share best practices and experiences. According to the municipality’s school policies, in the last announcement Arcobaleno pre-school in Carpi, as representative of the whole UtdA school system 0/6, participated in a project called What's up in education: new models for future pre-school services. In the project, along with Arcobaleno pre-school, which has assumed the role of promoter and coordinator of activities, other two European partners are involved, a Swedish one - Ojeby forskoleenhet - and a Slovenian one - VRTEC Jelka. The project, presented along with other 203 applications, was one of the 45 approved and funded projects, with an overall budget of 123.340 euro (just over 38.000 euro for Unione Terre d’Argine). The whole project is realized with the support of Pedagogical Coordination Area and School facilities and quality Area - Educational and Scholastic Services Sector at Unione Terre d’Argine and it's supervised by Erasmus Plus National Agency. - ECEC services more in line to family and community needs. The project SPECIAL AGENT 006 - How a community can be a quality agent, promoted by the Educational and Scholastic Services of the Unione Terre d’Argine, submitted its proposal to the tender connected to the Regional Law n. 3/2010, aimed at developing the participatory processes, and came in second place amongst the 64 projects that reached the evaluation stage (Resolution n. 14153/2015 of the Regional Committee). The project is a continuation of the projects that had already been activated in recent years on the theme of citizen/user involvement, and proposes the inclusion of the community in defining a set of guidelines capable of increasing and promoting the active participation of citizens to 0/6 services of the Unione Terre d’Argine. Families, teachers, educators and childcare service managers will be called to take part in this objective, as will every other citizen or subject who is interested in contributing to the quality of the 0/6 services. In the 2015-2016 school year, the Pedagogic Coordinating Body of the 0/6 services (municipal and affiliated) of the Unione Terre d’Argine promoted the project ''It’s like this… if we want it to be 2.0'' to follow in the footsteps of the previous programme, and is dedicated to elaborating the themes contained in the Vademecum of the parents’ representative. The reflections, that came out in the working groups, were revised and integrated into three new sheets, ranging to implement and enrich the contents of the Vademecum.